Matilda (Mara Wilson) has been neglected by her parents ever since she was born. This has forced her to learn to take care of herself from a very young age. Though her parents prefer TV, Matilda prefers books. Matilda has educated herself through books, until her parents finally put her in school. Her teacher Miss Honey (Embeth Davidtz) is very nice, but the school's principal Miss Trunchbull (Pam Ferris) is cruel. Trunchbull likes to physically throw children she finds disagreeable and lock them into a narrow closet full of nails known as the Choke. Matilda is stuck in a bad spot, but she soon learns she has powers that will help her correct her situation. Directed by actor Danny DeVito, "Matilda" is based on the Roald Dahl book of the same name. Much like all of Dahl's stories, this is a kid-centric fantasy with very dark undertones. Mara Wilson plays the titular Matilda, who is a self-taught smart girl that will eventually discover she has a very powerful telekinetic gift. Matilda has had a hard life for such a young kid. Her parents, played by Danny DeVito and his real life wife Rhea Perlman, are the worst parents ever. They are quite neglectful of her, frequently treating her like she is stupid and inconsequential and often ignoring her completely. They eventually cave and put her in a school with a terribly mean principal named Trunchbull, played by Pam Ferris. Trunchbull was a former Olympian who specialized in events like shot put, javelin, and the hammer throw. Trunchbull uses these skill to toss children she deems bad out of windows and across the school yard. She locks children in a tiny nail-filled coffin-closet known as the Choke. Despite all of this, Matilda loves school and learning, mainly because her teacher, Miss Honey, played by Embeth Davidtz, is the nicest person she has ever met and helps Matilda flourish her learning in ways she never thought possible. Danny DeVito has directed his fair share of dark comedies, so the subject material within "Matilda" is right up his alley. We aren't exactly sure what happened to Roald Dahl in his life that made him write books where children are tortured by adults and/or have dead and/or supremely neglectful, bad parents, but it is a constant theme within most of his works. We also see that Dahl had quite a lot of contempt for television, but this is understandable since he is a writer of books. He channels these things into his writing, and this film adaptation of his book is a very good one, one that has mostly gone unnoticed from us for years. We had previously tried several times to watch "Matilda," but never really got into it. It's one of those movies that parents in 2016 will most likely have a problem showing their children because they are just too darn delicate nowadays. "Matilda" has many excellent elements, especially in the acting department. Mara Wilson does a great job as the titular character. Her sweet disposition makes her easy to root for, and we love that she comes to realize her powers in an appropriate way. Speaking of her powers, this is where the fantasy element comes into play as Matilda develops her telekinesis over the course of the film, learning to control her gift and figuring out when and where to use it. Danny DeVito and Rhea Perlman are character you love to hate. Their dislike of Matilda and subsequent neglect of her is terrible, but they play these roles so well! DeVito is so nasty, and Perlman is so neglectful, it makes you hope they never really neglected their own children. Embeth Davidtz is really great as the far-too-nice-to-be-real Miss Honey, get it, honey? And finally, Pam Ferris is mean, nasty, and despicable as Trunchbull the child-throwing principle. This is actually a very fun story that is almost like a live action cartoon. 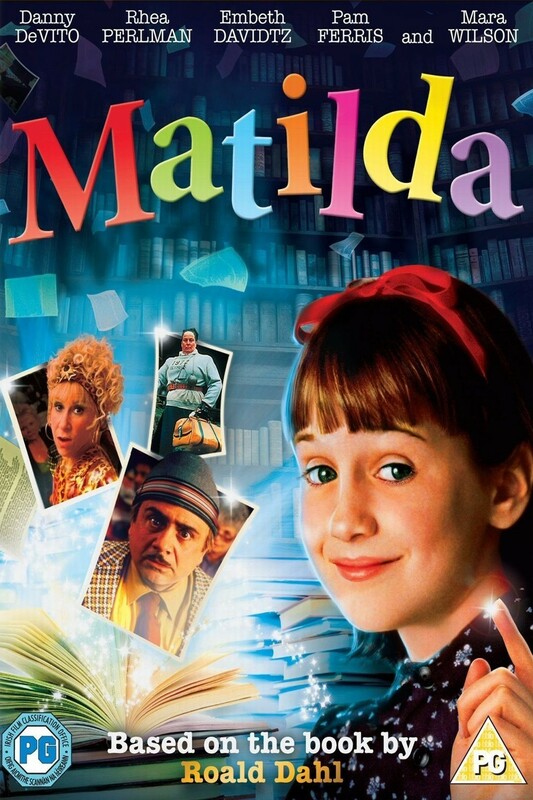 The dark elements begin to transition into lighter ones over the course of "Matilda," but it all remains suitable for people of all ages, even though we maintain parents today would forgo this movie in exchange for something lighter because parents don't want their kids to see anything even slightly bad these days. Sure, some of what happens is utterly ridiculous and a bit over-the-top, but that's the fun of a fantasy film like this. We never watched "Matilda" as kids, but watching it now, we really like it despite it being a bit predictable. One year ago, we were watching: "Insidious: Chapter 3"